To engage the system’s board in a discussion of potential significant changes in health delivery and finance, and develop organizational strategic direction through scenario planning. 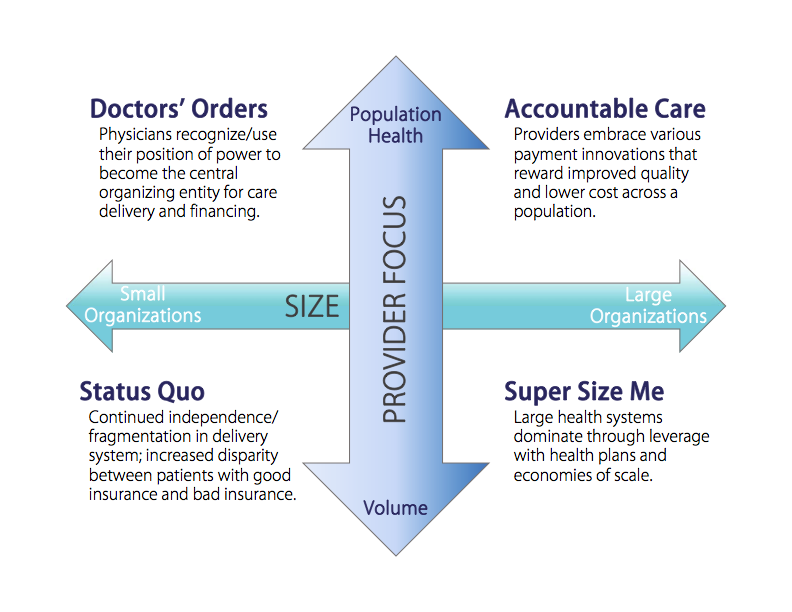 Veralon worked with senior management to clarify four scenarios (see graphic) that formed the basis of potential futures for the market and, eventually, potential strategies for the health system. The scenarios provided an effective framework to help Board members consider potential market shifts over ten years. Participants identified key steps required for success under each scenario, concluding with a discussion of steps that would be pursued under all scenarios. After the retreat, leadership summarized key priorities and action items to be pursued by the health system immediately, identified indicators to monitor, and agreed on trigger points for shifting future strategy.